Under the inspired direction of Simon Fournier , Tactus Chamber Choir sings Renaissance and contemporary choral works - often accompanied by dance, theatre or visual and sound-scapes - creating original, memorable performances. We are looking for bass, tenor, alto and sopranos singers who have choral experience and some reading skills. 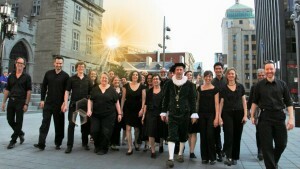 Rehearsals: Thursdays, 7:45 - 10:00 p.m., near Jean-Talon metro.